Hope this is being posted at the right sub forum. I had acquired a MG Zeta 2.0 prebuilt and was having hard time transforming it from Wave Rider form back to robot form. The waist or lower torso part do not seem to want to apart, it seems that the clasp or the part that look kind of like a long necked 8 with openings, https://www.1999.co.jp/itbig04/10046113z.jpg, parts J9 and J10, hope 1999.co.jp do not mind me borrowing it, were stuck or just hold on very tight. Was able to get one side to slide open, but when attempting to push it back for Wave Rider form and slide it open, J9 seemed to have trouble and might be on the verge of breaking. 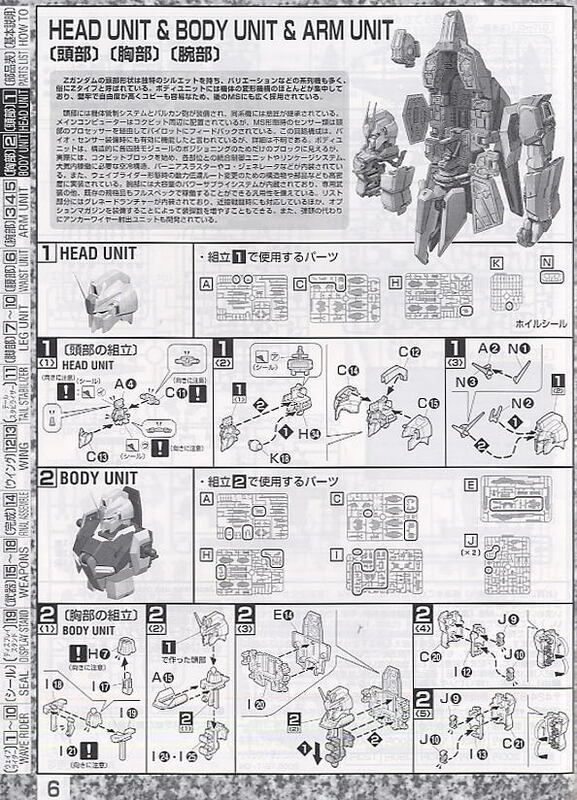 Has anyone had problem with the particular parts on MG Zeta 2.0 before? Any suggestion on how to make it work without breaking all the parts around it? It sounds like there's something hanging up or causing it to bind. Sorry I can't help with you problem because I haven't built that kit yet. How ever I can give you a good web site for gunpla information that has manuals and additional information. Hi, I built the grey MG MSZ-006C1 Ζeta Plus C1 version many years ago now, and I had no issues transforming it at the time. I did it several times, and I remember it being very fiddly, but nothing was stiff that I recall. Mine was painted, and I never damaged paint either. If you were not the builder its possible that it was not constructed correctly, or broken during a transform and glued permanently in that position by the original builder. Maybe? I actually did check dalong.net first prior to posting. Though cannot read Korean, but in the reviews, he will sometimes put notice of some odd things that might had occurred or things that might needed to be cautious. Did not find any mention of the lower torso part problem. Still, thanks. I do not have a built C1, but have (had) an A1 and there was no issue with the particular part either. The parts were not glued because they moved a little originally, and was able to move one side of the torso, but unfortunately did cause problem with one of the part as it turned white. Try Google translate. That's what I use. It's not a perfect, but it will get you by. I do use Google Translate, but most of time, just looking at the pictures will suffice. Anyway, did kind of the solve the issue. Took some time and took back and lower torso assemblies apart. It seemed that the clasp part, did its job, maybe a little bit too good and held on to the other part very tightly. I was able to make the part to move the way it supposed to, but it still get stuck from time to time. It seemed to be the J9 part problem. Because the parts are like 2 "G" shaped on the end and have a little nudge in the middle while clamping onto 2 small studs on the receiving part. And I suspect the little nudge might be the cause of the problem considering it will likely hit the studs sometimes. Sorry that I cannot explain it accurately, but such parts and assembly can be seen on Delta Plus as well as some other Gunplas. In any case, at the moment, I am unable to disassemble it further to investigate. But will try to do that sometime this week and if anyone is interested, will keep you update on the issue. Thanks to all the replies. By Vile in forum Modeling How-To, Tips, and Tricks. By johnmarlowepili in forum Modeling How-To, Tips, and Tricks.